Kurt Busch will have added incentive to put the No. 41 Chevrolet in Victory Lane for the third time this year when he takes the green flag Sunday for the Goody’s Headache Relief Shot 500 NASCAR Sprint Cup Series race at Martinsville (Va.) Speedway. 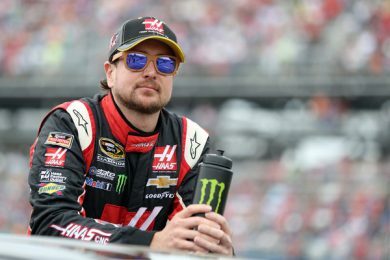 Just last week, Monster Energy announced it would partner with Haas Automation as a co-primary sponsor for Busch and his No. 41 team for Stewart-Haas Racing (SHR) in Sprint Cup beginning in 2016. Monster, whose black can features a neon-green, claw-ripped “M,” won’t have to wait until the next calendar year to see its logo adorn the hood and quarter panels of Busch’s Chevrolet SS as it will make its debut in NASCAR’s premier series at the shortest racetrack on the circuit this weekend. A longtime sponsor in NASCAR’s second-tier Xfinity Series, Monster Energy is accustomed to winning races and doing so often thanks to younger brother Kyle Busch’s efforts in the No. 54 Joe Gibbs Racing entry. In fact, 24 of the younger Busch’s 75 Xfinity Series victories have come with Monster branding on his racecar. So, the elder Busch might put a little added pressure on himself to continue those winning ways this weekend at Martinsville, a track where he’s twice claimed victory in NASCAR’s premier series. Busch won his first race at Martinsville in October 2002. It was his second Sprint Cup victory and a record-breaking one, at that, as he took the green flag from the 36th starting position – the deepest in the field a Martinsville winner had ever started. He took the lead for the first time on the 389th of 500 laps and lost it for only one lap the rest of the way. His racecar fishtailed off of turn two several times in the closing laps, allowing Johnny Benson to mount a challenge. Fast-forward to March 2014, when the 2004 Sprint Cup champion was able to end an 83-race winless streak by claiming his second Martinsville win. It was special for Busch, but was even more so for Haas Automation founder Gene Haas, who co-owns SHR with three-time Sprint Cup champion Tony Stewart. When Haas hired Busch, his directive was clear: win – be the guy to finally place the Haas Automation-sponsored Chevrolet SS in victory lane. Victory had eluded the largest CNC machine tool builder in the Western World for 114 races and 11 different drivers since 2002. While a third Martinsville win would add to the list of successes that Busch has experienced at the paperclip-shaped racetrack, it would do much more than that for the Las Vegas native’s 2016 championship hopes. A win this weekend would guarantee him a spot in the Championship Round of the Chase, and it would kick off the new partnership in style. — and that would be quite the monster achievement indeed.